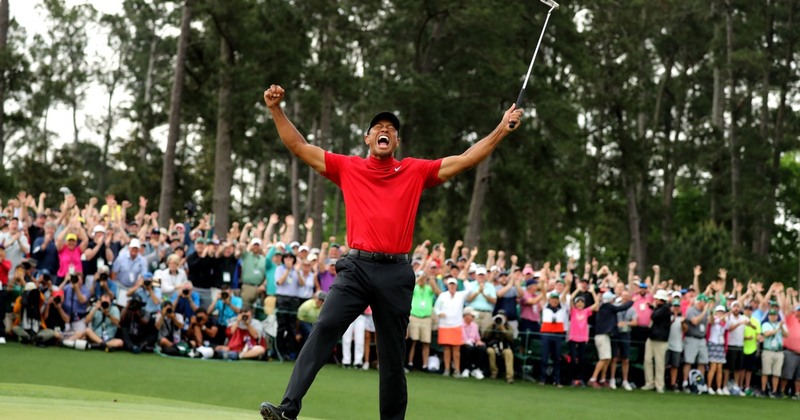 Tiger Woods won his fifth Masters title on Sunday, marking his first major victory since the 2008 U.S. Open. Woods shot 13 under par through the tournament. His victory comes after four back surgeries that left him wondering in recent years if he could ever play again. Woods, 43, became the second-oldest winner of the Masters at Augusta National, after Jack Nicklaus who won at 46 in 1986. Woods entered the final round tied for second with Tony Finau, two strokes behind Francesco Molinari. He finished the tournament with his signature fist pump and hugged his 10-year-old son, Charlie, mother, Kutilda, and 11-year-old daughter, Sam. Following his win, Nike, which has sponsored the golfer since the start of his career, tweeted: “Never stop chasing your crazy dream. #justdoit @TigerWoods” and released a commercial starring Woods. Nike signed Woods in 1996. Many social media users shared side-by-side images of Woods hugging his father, Earl, at the 18th hole after the 1997 Masters, and a photo from Sunday where he embraced his son. Woods won his first Masters title in 1997. His father died in May 2006. Woods reflected on the remixed father-son moment on Sunday, saying things had come full circle. Sunday was the first time Woods won a major when trailing going into the final round, and he needed some help from Molinari, the 54-hole leader who still was up two shots heading into the heart of Amen Corner.